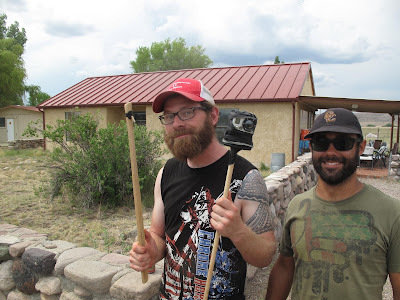 Archaeology Test Kitchen: GoPro Camera on an Atlatl Dart! GoPro Camera on an Atlatl Dart! Click here for full screen HD! A few friends and I were putting the gas station shootout test together when we decided to put a small GoPro video camera on an atlatl dart. I'm really not sure if this kind of thing has been done before, I know I've never seen it. We were all interested to see what the earth looked like onboard a flying dart so we taped the camera to the end of the weapon and set to work. I'll go ahead and say it, this is awesome! Take a look at this short clip that Danny Beard put together. Danny Beard works in film and is a student at the University of Colorado at Boulder. You can see the compression and flex as the dart is launched. This is one of the physical aspects that makes the atlatl so powerful. As the dart is launched, the mass of the projectile point (or camera) at the front of the weapon forces the dart shaft to flex. The flexed dart shaft springs forward during release and rockets through the air. I attached the feather fletching in a way that made the dart spiral like a rifled bullet. A spiral helps to maintain accuracy down range, just like any other spiraling projectile such as a football or a bullet. You can see the spiraling really well on the footage. This was a really fun side project. How cool is it to see the earth from a flying atlatl dart! Special thanks to Danny Beard and David Loome. Loved it - great job guys!